The answer to this question isn’t generally so black and white as there are usually a bunch of other questions hiding beneath it. How do I know if I’m scoring a deal or paying way too much? Does paying more for a DJ mean they will be better? Does paying less mean they will be much worse? What should be included in the price that I pay? 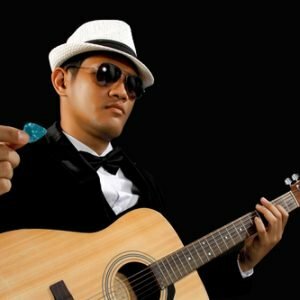 How do I make sure that I hire a good DJ? What could happen if I hire a bad DJ? It’s tough to know the answers if you’ve never hired a DJ before so we decided to take a few minutes to answer these questions for you based on our experience performing across Canada and the US at more than 3000 weddings and events since we started in 2007. To be clear, we’re not going to try to “sell” you on our company. We know that what we do is amazing (and our happy couples agree), but we’re not necessarily for everyone. We’re writing this because you deserve to know the truth about DJ pricing and we want to help you make an informed decision about what’s right for you. Most bargain DJs are amateurs or hobbyists that have a regular “day job” and provide wedding entertainment on weekends for fun. They may be genuinely passionate about what they do, but often aren’t as easy to reach and may not be available for all of the meetings and phone calls you’d like to have when planning your big day. This lack of communication can add additional stress for you through the already hectic planning process. Some of these lower cost DJs are just starting out or are nightclub DJs who are inexperienced in the intricacies of announcing speeches, timing the music for a ceremony, reading a crowd and playing music for an audience of mixed ages and music tastes. All that to say that they typically have less experience and knowledge of the specific skills that are required to ensure that your day is memorable and stress-free. You may want to consider that the Bargain DJ has only budgeted the time they will spend at your wedding, not the time required for meetings, calls and emails pre-wedding. This has the potential to lead to additional bills, cancelled performances, or in some cases, never hearing from them again (we typically hear about this a handful of times per year). You’ll frequently find mixed, or few reviews of these DJs as their performance tends to be inconsistent. You may catch a good one on a good day but, then again, you might not. Some of these DJs are working full-time offering a budget service. We call these “fast food” entertainment companies. These DJs focus on the number of weddings rather than delivering quality service. Their performances tends to be more standardized and lack personalization because of the need to serve lots of couples with a minimum investment of time in order to make money. They exist because their price appeals to a certain percentage of the market that may be working on minimal budgets and is willing to take a risk on their DJ to cut costs. It’s kind of like going to McDonald’s; they focus on feeding people as quickly and efficiently as possible. Get ‘em in, get ‘em out. Will you get what you order? Sure. Is it going to be a gourmet meal? Not a chance. While there may be many talented DJs in the bargain category, I wouldn’t recommend this option to my friends and family. While it has worked for some, my advice is to be careful and only go this route if you know and trust the DJ (not just because they are family or an acquaintance), or can verify their testimonials. The DJs in the “average,” price range tend to have a bit more experience, education and better reviews. These wedding DJs tend to take their businesses more seriously as most of them are full-time or on the way there. They show up on time (usually), play music and offer standard MC services. Often these DJs entertain for all kinds of events, including weddings, bar mitzvahs, birthday parties, high school reunions, corporate events, proms, nightclubs, and karaoke events. They aren’t wedding specialists, so they may not be experienced or equipped to deliver top- notch service that is catered specifically for a wedding. So, while they may have performed at some weddings in the past, they may not be fully aware of all the specific details and backup plans that should be considered when planning the music for your wedding. Keep in mind that these types of DJ companies are often “one-person-DJ-companies.” This means that one single person is handling customer inquiries, responding to client emails, planning music and timelines, and going out to perform at weddings and events PLUS often working a full-time job throughout the week. They are often slow to respond to your questions and lack depth in their customer service. It also means that if they are unable to make it to your wedding, you don’t have a DJ for your wedding (and we typically hear about this a few times per year). Average wedding DJs are like Denny’s; standard and mediocre food. You have more opportunities for customization; however, it’s still not ever going to be anything close to a gourmet meal. Going with a DJ in the “Average,” category is far more likely to result in a better experience than their “Bargain,” counterparts. However, you may find that the response time, depth of planning and support you receive are lacking. While there are good “Average DJs” out there that can deliver on what you are looking for, my advice is to thoroughly research a DJ in this category before working with them. Read reviews, watch videos, interview them using our ‘Top 12 Questions to Ask Your Potential DJ’ (email us if you would like a copy of this) and only when you feel incredibly confident that they will deliver on everything that you are looking for should you book. Of course, I’m biased because our team happens to fall into this category, but there’s a reason this option costs more. Wedding Specialist DJ Companies have lots of experience. They’ve performed for hundreds, or even thousands, of weddings and have years of experience. These DJs invest in regular training and skill development in music research, mixing, music production, MCing, lighting setup, audio setup and so much more. They buy the best equipment and attend industry events to learn more about weddings and what’s happening in the DJ world. To put it short, Wedding Specialists live and breathe weddings. Now that’s not to say that they won’t work the occasional birthday party or corporate event, but most DJs in this category will focus 95% of their time on being wedding professionals. Wedding Specialist DJs charge a premium because they deliver a premium service. These types of DJs understand that their role is about so much more than just playing good music; their job is to make sure everything goes smoothly both on the day of and in the time leading up to your wedding. You’ll find tons of five-star reviews for these companies for a good reason—they deliver. You can equate it to eating at a five- star restaurant. You can expect the highest level of skill, professional service and attention to detail at every step of the way; they have a good reputation for a reason. Just like Airwaves, companies in this category are often a larger, more established DJ company with a team of DJs and support staff, as well as thorough systems in place to provide a quality experience throughout the entire planning process and on the day of your wedding. 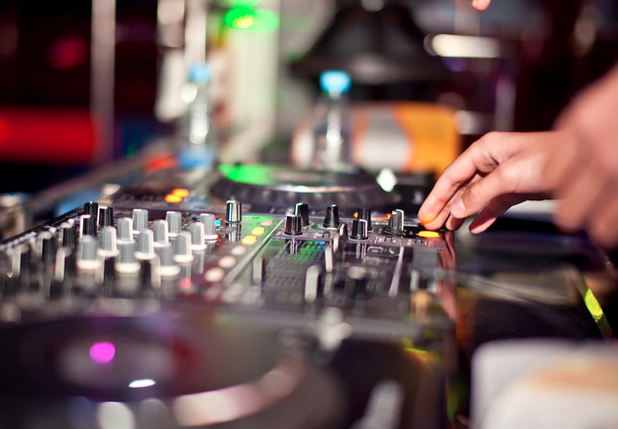 Two things our company provides for our couples is a backup DJ on standby just-in-case their primary DJ is injured or sick etc. as well as a dedicated Event Manager on staff to oversee the entire planning process so that our couples have peace of mind that everything is taken care of and no detail is overlooked. While this level of service isn’t that important to all couples, it is one of the reasons that many larger, more well-established companies like ours may charge more than a one-person DJ company. Wedding Specialist DJs are the best option when it comes to ensuring that you get everything that you want in your DJ (plus a lot that you didn’t even know you want). They will take the time to consult with you, find out more about your wedding, your vision and your style, and then follow through with their promises. Now that’s not to say that every single DJ that charges more is a Wedding Specialist DJ, but “you get what you pay for,” definitely applies to wedding DJs. In fact, many times couples have found the opposite to be true. 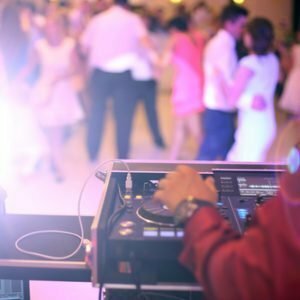 Some DJ’s have built a great reputation over decades of performing but are burned out and don’t really enjoy DJing weddings and events anymore. To make it worth their while they charge higher and higher fees each year to give them a reason to actually take on the booking. Maybe, but in most cases probably not. It can be very difficult to tell. At Airwaves, we have a few DJs who have been with us for many years so they have built a reputation within our company. These DJs have charged more in the past and have always done a great job for us, so we’ve been happy to bill them out for more. We’ve also hired DJs that charged $1300 instead of $2000 and had great results! In our experience, price matters to an extent, but after a certain threshold, paying more for a DJ doesn’t make a significant difference. At first it seems like the least expensive option is the best way to go. That’s got to be the best way to save money, right? Sometimes going cheap can be a good idea, but it can also lead to a wedding disaster. That’s why paying more for your DJ is important up to a certain point. While there are always exceptions to the rule, if your DJ charges under $1000 I might be concerned they may not be experienced, professional or reliable. On the other hand, if a DJ charges $2000 or more then you might be overpaying for a DJ who has lost their passion and is only doing it for a pay-check. What we found was that over 70% of wedding guests remember the music, the atmosphere, and the party the most. More than your dress, cake, decor or even food, your wedding guests are going to remember how the party was. Did people stay late and dance? Was the music fun and did it flow seamlessly? Was the DJ approachable, friendly and interactive and did he really “get” your style? If you end up with an unreliable or low-quality DJ, is that okay? Will you still have the wedding you want without it? Is saving some money worth the risk? If it’s not crucial that you get everything you want delivered precisely to your standards, hiring a low-priced wedding DJ might be a good idea. You’ll probably find someone who shows up, plays music and gets the job done to at least an adequate level. On the other hand, if not having fantastic entertainment that keeps your guests dancing all night long is going to be something you’ll regret, it makes sense to invest more in someone who can deliver everything that you want. You deserve a wedding day that’s exactly how you want it to be. You should hear the songs you love and none of the ones you hate! Your wedding should entertain all of your guests, from your friends to your grandparents. 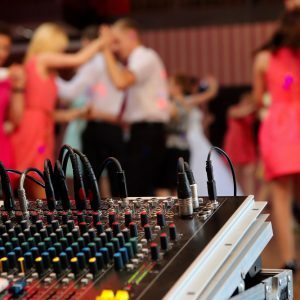 You should dance all night long with the peace of mind that your DJ company has planned for every little detail and every possible thing that could go wrong. Above all, your wedding should be entirely “you.” Your style, your personality, your love story, nothing cookie-cutter about it. You should never have to suffer through an obnoxious, corny DJ who steals the spotlight or cheesy songs you hate; this is your day. That’s our company motto. We believe that our couples personalities should shine through in the music on their wedding day which is why it’s our job to ask questions, listen, learn about you, and then let you know if we think our team is possibly even a good fit for your vision. Most of our couples spend anywhere between $1,000–$2,000 on their wedding entertainment, and everything we do is fully personalized to them. There’s a lot involved in finding and hiring the right wedding DJ. This guide should point you in the right direction; however, we’re happy to answer any questions that you may still have or provide any additional resources you might need. If you’d like to know more about our packages and pricing then request a quote! If you’re only interested in the lowest price, we’re probably not the company for you, but if you’d like to know more about what you get for the price then let’s chat, we would love to learn more about you and your vision for your wedding.